It’s the final official Christmas episode, but of course the guys couldn’t fit it all in one download. 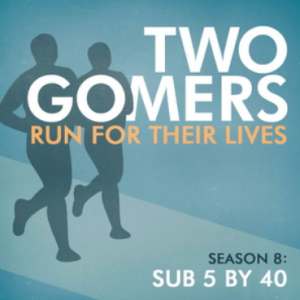 So please enjoy Part I, where the Gomers discuss their (not too great) weeks of running, the shelf-life of Home Alone, and whether or not they’ve kept their Chipotle-related commitments. In Part 1 you’ll hear the Christmas Intro, their Weeks in Review and a special True Gomer Confessions. Hope you enjoy the five days of four downloads from the Gomers, continuing tomorrow! Previous PostSeason 3 : The TGRAM:S5S Jingle 1st cut!Next PostSeason 3 : Episode 4, Part 2 – Happy Festivus, GomerNation! OK guys, after listening to this episode I just had to say something. Steven says it all comes down to “You do it or you don’t do it,” right? I’ve begun to really see a glaring difference between the Gomers this season in regards to that statement. I love you both and have been with you since the beginning, so I don’t want you to take this as some jerk just spouting off at you, ok? But it really seems to me, and I can’t imagine it isn’t obvious to a lot of other listeners out there, that this season Steven has chosen the first option (do it), and Anthony has chosen the other option (don’t do it), over and over. Again, I’m saying all this because I’m a huge fan and want you to see this about yourselves. Steven I also think you cut Anthony too much slack. You’re constantly saying things like “oh no, it’s not that bad” when you should be challenging him to step it up to the level you’re working at. I know Anthony’s busy, but it sounds like Steven is too, and by my count on Twitter, Steven’s run almost TWICE as much as Anthony this season! Don’t know what you guys want to do with this info, but I hope you take it seriously and start to hold each other accountable like we, the Nation, have come to expect and hope for ourselves. Basically, I think I should have written that last comment as a question instead of an accusation. Like – here’s what I’m noticing, is that accurate? Instead, it reads like an attack, and I didn’t mean it to. I am a coach, and am obviously passionate about pushing yourself in healthy ways, and I think I went overboard here. Also, I just listened to the most recent episode and realized Anthony is running his first big race in a while TOMORROW. &%$#! You probably didn’t need some outsider (uninformed at that) questioning your resolve right now. I’m sincerely sorry. Please know that what I said is still something I noticed and wanted to bring it to you for good discussion, but I apologize for how I did it. Hopefully you forgive me and I can still be a member of the Gomernation! Love the podcast and always have. We have a lot of stuff coming up, but for good or bad your comment (among others) is part of the Gomer Season 3 narrative. Again, no hard feelings and your apology was really cool and perfectly timed, and I look forward to talking to you more soon!